Are you a fan of chewy and rich chocolate cookies? 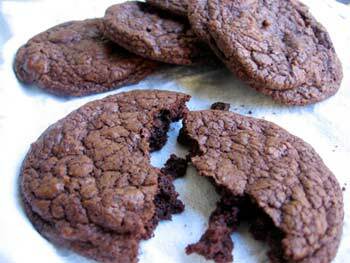 Then you'll want to put this easy chocolate cookie recipe on your "must try" list. It's full of rich dark chocolate goodness from melted bittersweet chocolate, unsweetened Dutch-processed cocoa powder and chunks of bittersweet chocolate. Coffee is a natural partner to chocolate. It deepens the chocolate taste. So this Chewy Chocolate Cookies recipe calls for adding some espresso powder (or instant coffee granules), but if you prefer, feel free to leave it out. If you haven't made the switch from regular unsweetened cocoa powder to Dutch process cocoa yet, I encourage you to do it the next time you need to replace your cocoa powder. It provides deeper, darker chocolate flavor in all your baking. Learn more about the differences between natural and dutch process Cocoa Powder. This recipe for Chewy Chocolate Cookies calls for 8 ounces of chopped bittersweet chocolate divided in half. You chop and melt 4 ounces of it to mix into the dough. The other four ounces gets stirred in at the end right before baking. Use a small to medium size cookie scoop to make drop cookies that are quick, easy, and uniform in size so they bake more evenly. And remember to only place cookie dough on cool cookie sheets prior to baking. Preheat oven to 350F degrees. Line baking sheets with parchment paper of silicone liners. Melt 4 ounces of the chopped chocolate in the microwave or on the stove top (whichever you prefer). When the chocolate is smooth, stir in espresso powder or instant coffee. Set aside to rest while you prepare the remaining ingredients. In a medium bowl, whisk together the flour, cocoa, baking powder and salt and set it aside while you mix the wet ingredients. In a large mixing bowl, beat together the butter and sugar with an electric mixer on medium speed until creamy. Beat in the eggs, one at a time, mixing well after each addition. Beat in the melted chocolate and espresso mixture. Stop and scrape down the sides of the bowl with a rubber spatula if necessary to make sure all your ingredients are well blended. Add the flour mixture just until combined. Gently stir in the coarsely chopped chocolate, being careful not to over mix. Scoop dough by two-tablespoon amounts onto lined baking sheets, spacing the scoops of dough at least 2 inches apart. (I like to do this with a small ice cream scoop.) Bake until the edges of the cookies are just dry, about 13 to 15 minutes. Remove from the oven and carefully transfer cookies to a wire rack to cool completely. This recipe yields about 2 dozen Chewy Chocolate Cookies. Recipe source: Everyday Food - From the Kitchens of Martha Stewart. These chocolate cookies have a lot going for them. First, they are easy because they call for cocoa so there is no need to melt chocolate. And they're delicious with just the right combination of chocolate crispy chewiness. Best of all, this simple chocolate cookie dough can be customized in lots of different ways, making it the perfect cookie recipe you can adjust again and again and never make the same exact chocolate cookie twice - unless of course you want to! I've provided several great recipe variations for you to try, but please feel free to create your own cookie masterpiece. Position an oven rack in the center of the oven and preheat to 375F degrees. For best results and easy cleanup, line 2 or 3 baking sheets with parchment paper. Otherwise, use ungreased baking sheets. In a medium bowl, stir together flour, cocoa, and baking soda until well combined. In a large bowl beat butter, sugars, vanilla, and salt with an electric mixer on medium speed until creamy. Scrape down the sides of the bowl with a rubber spatula once or twice if necessary to make sure all the ingredients are well blended. Add the eggs and beat until well blended. Stir in the flour mixture just until incorporated. Drop the cookie dough by rounded teaspoonfuls onto prepared baking sheets spaced at least 2 inches apart. Bake one sheet at a time in the center of the oven until set, 8 to 10 minutes. Remove from the oven and cool for 2 or 3 minutes and then transfer the cookies to wire racks to cool completely. This recipe yields about 5 dozen Chocolate Cocoa Cookies. Add 2 cups (11 to 12 ounces) of your favorite flavor chips to the cookie dough. Dark chocolate, semi sweet chocolate and milk chocolate would all be delicious. Add 1 2/3 cups (10 ounces) mint chocolate chips to the cookie dough. Add 1 2/3 cups (10 ounces) peanut butter chips to the cookie dough for that winning chocolate and peanut butter flavor combination. Add 2 cups (12 ounces) white chocolate chips before baking. Add 1 to 1 1/4 cups toffee bits or chopped toffee candy bar to the cookie dough before baking.